Running with Zithers........: Running with Zithers' Musical Monday! Running with Zithers' Musical Monday! This coming Monday is the last Monday of the month and therefore March's Musical Monday. 10 am to 11 am Morning Zither Run/Group - a zither run is a 1 hour lesson to get the most out of your zither. We cover tuning, care, playing and navigating the tune-sheets. Everything you need to take your zither 'for a run' and just play. Suitable for all skill levels. $10 per session, includes the new tune-sheet and morning tea. 11:30 am to 12 noon Beyond the Strum - an auto-harp lesson helping you to get the most out of your auto-harp. We cover tuning, care and techniques. The $30 session cost can be divided i.e. 3 players = $10 each and includes sheet music and a cuppa. Please note that for the above lessons we have instruments available for you to use, should you not yet have your own zither or auto-harp, so why not give it a go? 1 pm to 2:30 pm - Running with Zithers Ensemble rehearsal - this ensemble is a group of Zither & Autoharp players who, with a percussionist, challenge their music-making to play and harmonize in a group. Ensemble membership asks for commitment to attend rehearsals, a sense of fun and an annual membership fee of $10 to cover the cost of sheet-music. Please note - the Running with Zithers Ensemble rehearsals are not open-to-all music lessons, they are genuine rehearsals for instrumentalists working toward performance and/or recording. If you would like to try out playing with this ensemble, contact Angie on 0408 379 499. 3 pm to 4 pm - Afternoon Zither Run/Group - a zither run is a 1 hour lesson to get the most out of your zither. We cover tuning, care, playing and navigating the tune-sheets. Everything you need to take your zither 'for a run' and just play. Suitable for all skill levels. $10 per session, includes the new tune-sheets and afternoon tea. 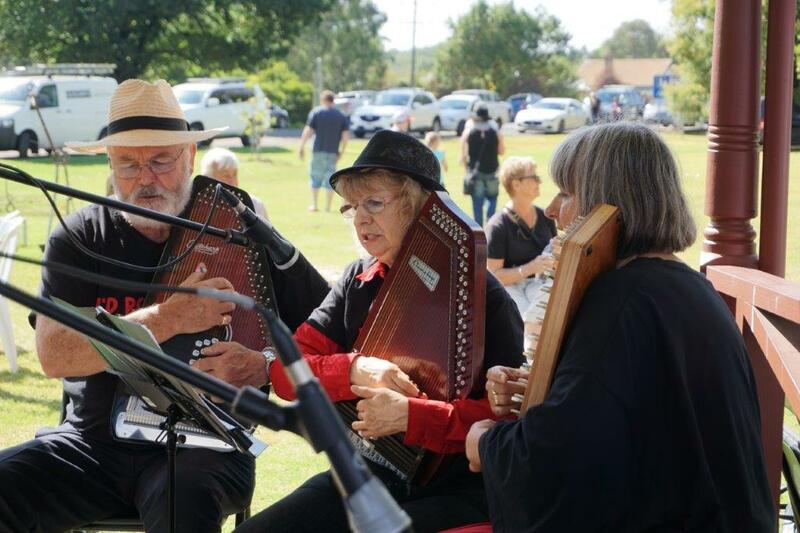 4 pm to 5 pm - Birregurra Community Arts Group Family Music Sessions with John James - These are fun, family music tasters introducing music to children of all ages through an eclectic range of instruments. $5 per session. 7 pm to 8:30 - The Birregurra Community Arts Group Singing Circle - singing for fun because it is sooo good for us. Everyone's welcome $5. Private music tuition - unable to attend Musical Mondays but wanting to start your own musical journey? Contact the following music teachers directly!